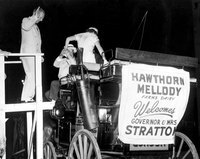 Governor and Mrs. Stratton ride in one of the Hawthorn-Mellody Farms' dairy carriages. A view of Hawthorn-Mellody's western town complete with a bank, general store, and covered wagons. 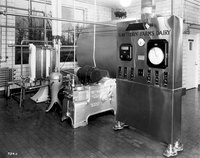 Photograph of the state of the art machinery that processes milk from dairy cows to finished product, ready to be delivered to homes across the North Shore. Exterior photograph of the general store at Hawthorn-Mellody Farms. Above the door reads "Club of Champs"--the advertising campaign using celebrity endorsements. 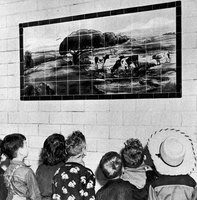 Children view the mosaic depicting a field of cows in the Milk Parlor at Hawthorn-Mellody Farms. 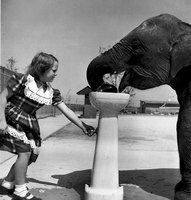 A young girl gives an elephant from the Hawthorn-Mellody Farm's Petting Zoo a drink from the water fountain. 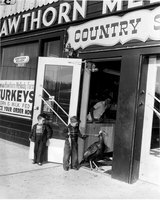 Boys interact with a turkey from the Hawthorn-Mellody Farm's Petting Zoo outside of the Country Store, an element of the western town attraction. 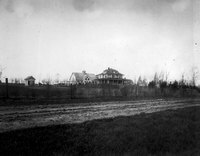 In 1907, Samuel Insull purchased 132 acres of land called Hawthorn Farm and the farmhouse which occupied this space. Construction on a new house began in 1914, but the original structure stood for some time. 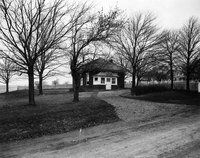 Founded on Hawthorn Farm--land purchased by Samuel Insull--the one room schoolhouse served children of employees and servants for the Insull home in Lake County. It was demolished in the 1990s, but it had been out of use long before this time. 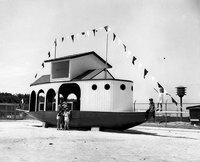 Children climb atop the Noah's Ark construction at Hawthorn-Mellody Farm's amusement park.